Women who photographed Native Americans were often commercial photographers who photographed American Indians as they would any other subject matter (Benedicte Wrensted fits this classification). Others ranged from camera-toting "tourists," to fine-art photographers (many of whom also exploited their art commercially). We will probably never know when the "first" woman made a photographic likeness of a Native American. In the American West, such a photograph would most likely have been taken after 1850. Her agitation was extreme. Her grief seemed to have reached its climax when she saw the Indians destroying her property, which consisted principally of such articles as belong to the daguerreian art. She had indulged in high hopes of fortune from the prosecution of this art among the mining towns of Idaho. As she saw her chemicals, picture cases, and other property pertaining to her calling, being destroyed, she uttered such a wild despairing cry as brought the chief of the band to us, who, with a gleaming knife, threatened to end all her further troubles in this world (Kelly 1872: 44-45). Although the record shows that the Larimers had already spent time photographing Indian country, there is no evidence to suggest that they ever photographed a Native American or that any of Mrs. Larimer's work survived. By happy contrast to the Larimer account, Hannah Maynard of Victoria, British Columbia, succeeded in photographing the Haida and Kwakiutl Songees over a five year period, starting about 1862. Many of her images survive today (Information courtesy Joanna C. Scherer). In 1873, when San Francisco commercial photographer Carleton E. Watkins was in the process of mass-producing large quantities of stereographs of the Modoc Indian War, it was reported that he was finishing the photos "in good style" and that twenty women and a "number of Chinamen [were] being kept constantly at work" (Yreka Journal, June 25, 1873). The women described here were doubtless piece-work employees, hired specifically to complete a particular task such as mounting photographic prints on stereograph cards. Sometimes data about women photographers is incomplete at best. Consider the following entry from the Federal Census for Humboldt County, California, in 1900, page 294: "Carey, Mrs. Elodia, photographer, born Nebraska , divorced and mother of three children." Reading further, one discovers that none of Mrs. Carey's children were living in 1900 and that she was enumerated on the Hoopa Indian Reservation in the northern California wilderness, some 350 miles north of San Francisco. What was she doing there? Was she a photographer there? So far we have no answer to these questions. Regarding the non-commercial photographers, I have selected a "baker's dozen" to profile - arranged chronologically - as a sampling of women who were known to have photographed Native Americans. Ed. Note: Photographers are organized in both an alphabetical index and an annotated chronological list, according to when they were active. In either case, click on the photographer's name to access her bibliography and gallery or essay. Emma Jane Gay (active 1888-1895). Emma Jane Gay was born in 1830 and died in 1919. A former schoolteacher and a dead-letter clerk, Gay taught herself photography in 1888, at age 58. With the help of ethnologist Alice C. Fletcher, she gained an unofficial position documenting land allotment work among the Nez Perce in Idaho beginning in 1889. Over the next four years, she and Fletcher spent several months at a time working in the field. In 1895, Gay began organizing her Nez Perce photographs, together with notes and drawings, into two leather-bound albums. These are located in Radcliffe's Schlesinger Library (Ritvo 1980 and Schwarz 1981). About four hundred and fifty of her negatives - on glass or flexible nitrate - are preserved at the Idaho State Historical Society, Boise (Dawson 1980). Grace Carpenter Hudson (active 1880-1900+). Grace Carpenter Hudson was born in 1865 and died in 1937. Hudson was enrolled in the San Francisco School of Design at fourteen where she studied painting for five years. Her mother, Helen Carpenter, had done commercial portrait photography in Ukiah, California, beginning about 1870, and her father was also skilled in the trade. Hudson learned hand-coloring early, but used the medium primarily as a means of getting working models for her paintings of the Pomo Indians. Her painting, "Little Mendocino" (a crying Pomo baby), created a sensation at the Chicago World's Fair in 1893. Known as the "Painter Lady," she became one of California's most successful artists. In addition to documenting the Pomos, she spent several months painting the native children of Hawaii in 1901 and in 1904 took a commission to paint the Pawnees in Oklahoma (Boynton 1978). Carpenter's negatives and many of her paintings of Native Americans are in the Grace Hudson Museum, Ukiah, CA. Nellie Tichenor McGraw (active 1899-1906). Nellie Tichenor McGraw was born about 1877 and died in 1948. McGraw was an amateur photographer, schoolteacher and lecturer. She was photographically active on the Hoopa Valley Indian Reservation, Humboldt County, CA, 1899-1901 and at North Fork, Madera County, CA, 1904-1906. After receiving a high school education, McGraw became interested in missionary life. She wanted to go to China, but her parents objected and she settled for a "home" mission. Her first job was as a teacher in the Presbyterian Mission School at Hoopa. While there, she used her camera to record the daily lives of school children, friends, and life on the reservation. Following her period at Hoopa, she purchased a Kodak Autographic Camera, which made postcard size negatives. She continued to use this camera during her tenure in Madera County. After 1906, McGraw traveled over much of the United States as a lecturer-hoping to "save" the Indians from "drink, immorality and the Roman Catholics" (personal communication, Joel W. Hedgpeth, April 1984). A number of her negatives are in the Phoebe Hearst Museum, University of California, Berkeley. Two albums of her photographs remain with her family (Palmquist 1991b: 223-224). Kate Thompson Cory (active 1905-1912). Kate Thompson Cory was born in 1861 and died in 1958. In 1904 Cory attended a social gathering of the Pen & Brush Club, an organization of New York artists. It was here that she heard about the beauty of the Hopi mesas of northern Arizona. The following year she traveled to the Southwest, where she photographed, seemingly for her personal pleasure, the Hopi villages of Oraibi and Walpi. "Cory lived with her subjects, knew them by name, experienced their joy and grief, their births and their deaths, their happiness when it rained, their fear of drought, the heat and cold they endured. Her understanding and admiration for them informs every photograph" (Wright/Gaede & Gaede 1986: 3). Cory also wrote articles about the Hopi which appeared in The Border magazine. At the age of 51 she left the mesas and settled into a reclusive existence in Prescott, Arizona, where she lived the rest of her life. She died at age 97, leaving behind a personal diary for the years 1907-1908 and 642 of her negatives taken between 1905-1912. This collection is in the Museum of Northern Arizona. Julia Ethel Tuell (active 1901-1913). Julia Ethel Tuell was the daughter of an Indian agent connected with the Cheyenne and Sioux reservations. Between 1901 and 1913 she made many photographs of Indian celebrations including ceremonial preparations and meditating. At least 200 of these negatives (6 1/2" by 8 1/2" on glass) are known to exist; however, their present whereabouts are unknown (Information credited to Carl Tuell, Yountville, CA). Miss Grace Nicholson was raised in Philadelphia, but came West for her health in 1901. At this time she was twenty-four years old with only a few hundred dollars to her name. She also had a high school diploma and some experience as a stenographer. Eight months later she opened a shop in Pasadena, California, to sell Indian baskets, Navajo and Hopi blankets, and antiques. Nicholson used photographs to document her purchases but soon became interested in recording the changing life of the Indian villages. Speaking before a church group in 1906, she told the audience, "We must recognize the Indian as an individual and not a tribe" (Apostol 1976). The majority of Nicolson's personal papers, diaries and 4,000 photographs and negatives are at the Huntington library, Rare Book Department, San Marino, California. Written materials and documents comprise about 2,560 items dating from 1922-1951 (Palmquist 1991b: 238-240). Mary W. Robinson (active c.1915). Mrs. Mary W. Robinson, together with her husband, produced high-quality art studies of Southwest Indians. In 1914 they issued a catalogue of their photographs called Lens Studies of Indians: A Collection of Pictures of Indians Made With the Camera By Mary W. and H. F. Robinson. In the foreword of this book they wrote their aim to "preserve interesting phases of the life and traits of the Indian of the Southwest, [for] the picture loving public" (Robinson 1914). The Robinsons claimed to possess some 3,000 images, a collection of which is in the Museum of New Mexico, Santa Fe, NM. Ruth K. Roberts (active 1915-1920s). 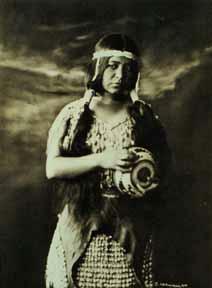 Ruth K. Roberts had a wide-ranging interest in the Indians of Northern California, especially the Yuroks. She photographed their dwellings, sacred sites, and daily activities. Basically a "society lady" from Piedmont, California, she undertook a "one-woman battle" for California Indians' rights. The Roberts Collection of Native American photographs is held by Humboldt State University, Arcata, CA. It consists of 536 prints and a large number of original negatives (Palmquist 1983), attributed to both her and her husband Harry. With thorough Kodak equipment and fair assortment of Woolworth's jewelry, go to some remote spot accessible by automobile, which you have previously found marked on the map as an Indian reservation. After putting up at the local hotel, saunter forth in the cool of the morning, and, upon encountering your subjects, display said jewels [and the Indians will fall over backwards to cooperate, etc.].... A three months' Kodaking experience among the Indians of the Klamath River has utterly destroyed any such illusions that I might have previously entertained. The first and last requisite to success in this line of photography...is that you have a natural love for this race of people. It is something impossible to fake, for instinctively the Indian senses your true regard for him. Therein lies the secret of his confidence in you. And without that, all the money and gewgaws in the world cannot accomplish your purpose (Ring 1924). Examples of Ring's photographs are located in the collection of the Southwest Museum, Los Angeles, CA. Emma Belle Freeman (active 1907-1925). Emma B. Freeman was born in Nebraska in 1880 and died in San Francisco in 1928. Freeman went to San Francisco to study painting. She operated a small art store but was driven out by the earthquake and fire of 1906. Freeman and her husband settled in Eureka, California, where she became interested in native culture. Between 1910 and 1920 she used her camera to produce a Northern California series of Indian portraits. Freeman often intermixed native costume - such as Yurok dance regalia and Navajo blankets - to create romantically conceived ideals of the "Noble" Indian. She frequently hand-colored her photographs and added allegorical details to enhance her compositions. Though sometimes shunned for her Bohemian lifestyle, Freeman did much to improve public sympathy for the Native American in Northern California. In 1915, for example, her principal model, Bertha Thompson (Princess Ah-Tra-Ah-Saun), was selected to head the parade at the Panama Pacific International Exposition, which was held in San Francisco. An album of Freeman's photographs is in the California State Library, Sacramento, CA. Other examples may be seen at the Newberry Library, Chicago, IL (Palmquist 1977). Laura May (Adams) Armer (active 1899-1930's). Laura May Armer was born in 1874 and died in 1963. Armer received training from the Mark Hopkins Institute of Art in San Francisco. By 1900 she had opened a business as a portrait photographer in San Francisco and was a regular participant in photographic salons as well. Armer also wrote six books, mostly for the "young adult" market. Her first, Waterless Mountain (1931) won the Newberry Award and the Longman, Green & Company's prize for juvenile fiction. Her last book, In Navajo Land (1962) was published when she was 88 years old. Examples of her photographs can be found at the California Historical Society, San Francisco; the Phoebe Hearst Museum, University of California, Berkeley; and the Wheelwright Museum, Santa Fe, NM (Dicker 1977 and Palmquist 1991b: 9-14). Peter Palmquist is presently working on a monograph on Armer's life and work. Josephine A. Kemp (active 1899-1935). Mr. and Mrs. Edward H. Kemp visited the Snake Dance ceremonies of the Moki [Hopi] Indians again this year and as usual secured a fine collection of negatives...they [also] succeeded in making several very successful series of moving pictures. These were shown here during the last month and elicited a great deal of admiration from the large audience which filled the Alhambra theatre on the evening of Mrs. Kemp's lecture. Theirs are believed to be the first satisfactory moving picture films secured during one of these weird ceremonies. Examples of the Kemp's hand-colored lantern slides of the Southwest are included in T. C. McLuhan's book, Dream Tracks (1985). Other examples are located in the Palmquist collection. Laura Gilpin was born in 1891 and died in 1979. Gilpin spent more than sixty years photographing in the American southwest. She is best known for her images of the Pueblo and Navajo Indians and is considered to have bridged the gap between the sentimentality of earlier photography and the objective documentation of later years. Even though she worked regionally, she enjoyed an international reputation for the quality of her work. Gilpin created a visual record of the Southwest that emphasizes the historical influence of human development on the landscape. She also wrote four books: The Pueblos: A Camera Chronicle (1941), Temples in Yucatan: A Camera Chronicle of Chichen Itza (1948), The Rio Grande: River of Destiny (1949), and The Enduring Navaho (1968). The Amon Carter Museum has more than 20,000 of Gilpin's negatives as well as substantial amounts of correspondence, notes, books and printed material relating to her life (Sandweiss 1986). For additional information, please see Martha Sandweiss' essay "Laura Gilpin and the Tradition of American Landscape Photography" in Women Artists of the American West.